The Medicare Advantage era is dawning in senior living. Due to policy changes implemented this year, these insurance plans appear poised to become a more important payer for senior living services. Under Medicare Advantage, federal dollars flow to private-sector insurance companies—including giants such as UnitedHealthcare (NYSE: UNH) and Humana (NYSE: HUM)—which offer benefits packages to seniors as an alternative to traditional, government-run Medicare. Details are still unknown regarding the changes implemented this year, but the most proactive providers and health systems are already getting on board in anticipating that more in-home services will be covered by Medicare Advantage in the coming years. Senior Housing News has done a deep-dive examining the scope of this opportunity and strategies for providers to position themselves for success. Focusing on the home as the place of care for chronically ill individuals—whether that be a private home, or senior housing unit—aims to drive costs out of acute care and into lower-acuity settings. “There’s really one major policy change in Medicare Advantage that has ramifications for senior housing and that’s the new flexibility in offering of supplemental benefits [in the home],” says Anne Tumlinson, CEO of Washington, D.C.-based health care consultancy Anne Tumlinson Innovations. While on its surface, it may appear that private duty (private pay) in-home care providers are best-positioned to benefit from this change, senior housing providers that offer these settings are arguably a better partner for Medicare Advantage plans as they can control the services and the environment where those services are delivered at scale in one location. Providers not only have a great deal of control over residents’ environments through existing technology tools such as fall prevention and remote monitoring devices, but they also are tasked with providing food and nutrition, medication management and other services that tie directly to an individual’s health outcomes 24/7. Medication management alone accounted for 26% of hospital readmissions, according to a 2017 study published in the Journal of the American Pharmacists Association. Already, insurance providers are taking note, such as SCAN, one of the largest not-for-profit Medicare Advantage providers, with more than 190,000 members. Such a collaboration will not be without challenges, however, for insurance companies that have not yet worked directly with senior housing providers and may not be entirely familiar with the operations and service structures. —Providing a more comprehensive care plan that includes a primary care contact and a full continuum of care services. Besides the care coordination, senior living providers have a population that is attractive to Medicare Advantage insurers. The average age of today’s resident is 87, according to the National Center for Assisted Living. Three-quarters of residents require support with activities of daily living, and 95% have chronic health conditions, according to research conducted by the University of North Carolina at Chapel Hill and University of Georgia that was published in 2016. The vast majority of senior housing residents are eligible for Medicare and could likely utilize its benefits. With Medicare spending comprising 20% of the total national health expenditures, according to CMS, the senior population is a major part of the U.S. health care spending problem. But it can also be a big part of the solution, experts say, via settings and programs that focus on care coordination. 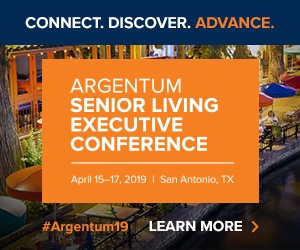 Senior living operators have several different ways to work with Medicare Advantage, all with varying degrees of complexity, opportunity, upside and downside. Launching and owning a Medicare Advantage plan. Partnering with an existing insurance company to become a contracted in-network provider or partnering with another care provider that offers a Medicare Advantage plan to its residents. By whatever means they decide to partner with or utilize Medicare advantage, some are seeing this as the future of senior housing. Click here to access the complete report. It expands on the how and why of launching MA plans and partnering with existing insurers, and includes original insights from organizations including Optum/UnitedHealthcare, Avalere, and senior living providers on the forefront of Medicare Advantage.